What do Nathan Outteridge, Sime Fantela, and Tanja Frank all have in common? They all won medals in Rio, have taken charge today in Aarhus, and are sailing different classes than they were sailing 2 years ago when they won Olympic medals! Aarhus has proven to be a challenging venue, with offshore winds, lots of varied conditions, and high average scores in all of the fleets. It seems the teams excelling in these conditions are the ones fresh to these classes, but with plenty of experience behind them. Siblings Nathan and Haylee Outteridge had a fantastic day to kick off gold fleet, with a first, third and fifth shifting them up into first overall. These two have only been sailing the Nacra 17 since June, but have quickly found a way to be competitive and and consistent. Nathan comes to the Nacra 17 from a third place finish in the 2017 America’s Cup as sailing director and helmsman of Artemis Racing. He also won a Silver medal at the Rio Olympics in 49er and a Gold medal in the 49er in London before that. It will be no surprise to the sailing world he’s finding success in another Olympic class, but leading at this stage of a World Championship is likely beyond their expectations at this point. A windy forecast for tomorrow should prove another test for these two amiable sailors. With an almost identical scoreline to the Outteridges today was Ruggero Tita and Caterina Banti (ITA) who scored a 3, 5, 2. Tita and Banti have dominated the Nacra 17 fleet since it went foiling, but suffered a tough final four races in qualifying. 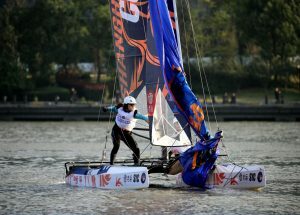 They were disqualified for a boat on boat incident in race four, and then make a couple mistakes on the final day when it was incredibly light. Nevertheless, with their three bullets to start the regatta and a great day today, they find themselves back in contention in fifth place. With a number of light and shifty races so far this championship, a windy day of racing should make for a well rounded regatta, and be a great reflection of who’s at the top of the game. 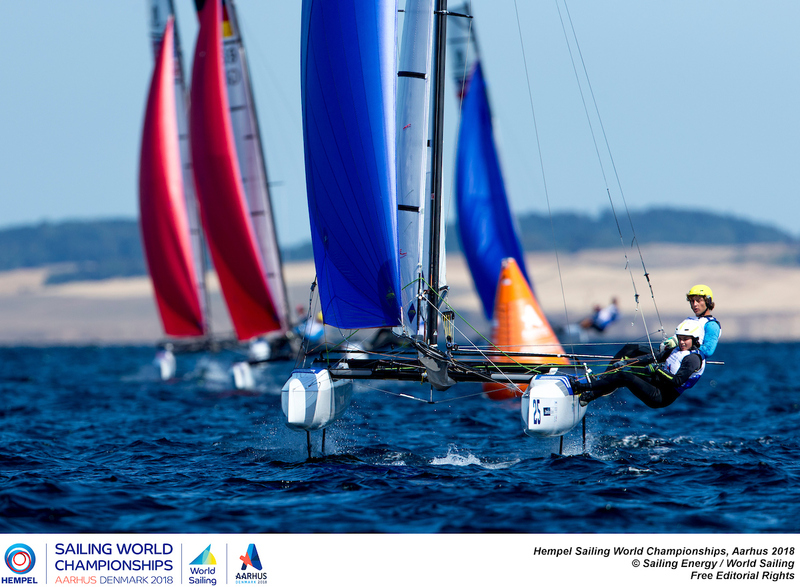 The Nacra 17 races are scheduled to be on TV, so stay tuned from 15:30 local time. 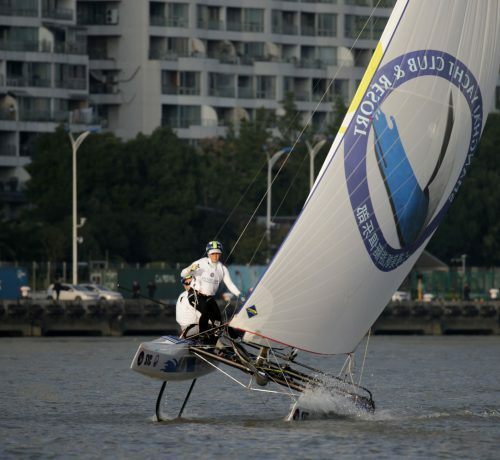 The Nacra 17 has three more races scheduled for tomorrow followed by their medal race on Sunday.